Overall size: 34" x 25"
Image size (including yellow inner border): 30 1/8" x 20 5/8"
Within 9 months of the historic Normandy landings, the US First Army had reached the Rhine � Germany�s last blockade against the advancing American onslaught. Hitler had ordered German troops to prevent at all costs the US Army establishing a bridge-head across the river and, as they retreated to the eastern bank, the vital bridges were to be destroyed. Like all strategic river crossings, the Ludendorff Bridge at Remagen had been packed with explosives and primed for detonation, but either sabotage or a lucky tank shell took out the command wire, preventing all 60 charges from exploding. When news reached Hitler of the American crossing at Remagen he ordered everything imaginable to be thrown at the bridge in an attempt to destroy it. V2 rockets, underwater frogmen, saboteurs and all aircraft at the Luftwaffe�s disposal were sent into action. 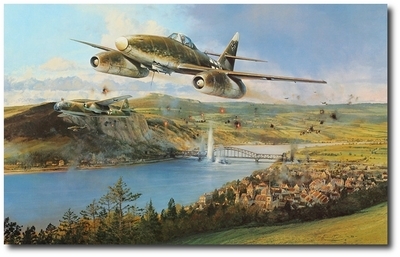 Lifting off from their bases, a combined force of the Luftwaffe�s new jets, Me262 and Arado 234 bombers, set out with great determination to take out the Bridge at Remagen. The attacking force flew through a terrifying barrage of American anti-aircraft fire from batteries now dug in on both sides of the railroad bridge. Relying on their incredible speed and manoeuvrability in an effort to destroy their target, this valiant mission was the first significant combined aircraft attack in the history of jet combat aviation. 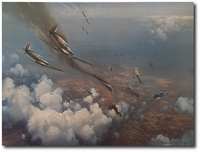 Robert Taylor�s fine rendition of this historic action shows the lead aircraft powering through the hail of ack-ack and tracer fire; to the left a twin engine Arado, the world�s first jet bomber, banks away sharply to avoid the maelstrom, having survived its daring attack. Superbly painted in Robert Taylor�s inimitable style, the world�s greatest aviation artist has recreated one of the most vital actions fought during the latter part of war. Commemorating the new era of jet combat.